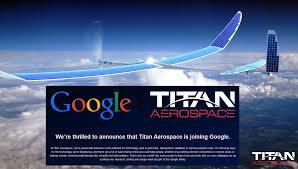 Google has bought Titan Aerospace, a company that makes of solar-powered drones. Google’s main objective behind this acquisition is to bring Internet access to remote parts of the world as well as solve many other problems. However, the financial terms were not disclosed. As per Google Inc atmospheric satellites could also be used in disaster relief and assessing environmental damage. Before it was updated on Monday to reveal the acquisition, Titan’s website cited a wide range of uses for the drones, including atmospheric and weather monitoring, disaster response and voice and data communications. Although still in still in development and not yet commercially available, Atmospheric satellites by Titan can stay in the air for as long as five years as per the reports. Both Google and Facebook are making continuous endeavors to get everyone on the planet online by launching ambitious projects.